You see, my five-year old is on this cheese pizza kick, and he is sooooooo not an eater. Not a healthy eater. Not a bad eater. He’s just not much of an eater. I think it comes from the days when I was nursing him and realized, a bit later than I should have, that he was in the 4th percentile (which is an indication that either a kid is starving or has something seriously wrong with them) and in our case… he was starving… my milk was not so much milk as it was… water. Yeah, as if nursing isn’t already the most difficult part of motherhood, add the guilt of starving your first child. That was a rough time for me… we’ll leave it at that! Haha! Anyway, so when he likes a food… I pretty much jump on it. Unfortunately the effect of this is that he then almost ODs on whatever food he likes and then never wants it again. But until I choose to learn from that mistake, when the kid asks for a cheese pizza (which is really only like every other week or so… I’m being over dramatic about it simply because he almost never requests food), well… then I give him a cheese pizza. Oh wow… ANYWAYYYYY all of this to say, he ate about half of the pizza. And so what was left? Yep… the other half of a cheese pizza. 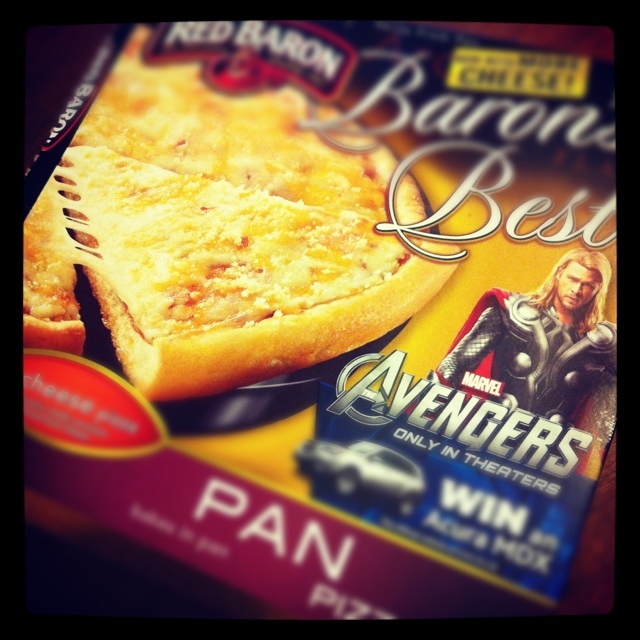 A cheese pizza that’d had Thor’s picture on it. Sure, I had already eaten my dinner. No, of course I wasn’t hungry. And I already mentioned that I was tired. This is a bad combo… pizza + tired = fail. And I ate his left over piece and two more pieces. Shame. Guilt. Sorrow. Grief. Resolve. Shame. Guilt. Sorrow. Grief. Resolve. But one thing that I have started to add in to that cycle whenever I eat when I shouldn’t or eat something I shouldn’t or eat in a way that is not honoring God because it’s eating for a reason other than eating to live… then I add in the step of evaluating WHY I ate when I wasn’t hungry. or what I shouldn’t have. or too much. And a lot of times it is because I am tired. My revelations on the importance of sleep are going to come up more in another post, but in essence, if at all possible… I need to get enough sleep. Sure, I have a toddler, so this is not always possible. But when I can get enough sleep, I need to shut down facebook, shut down my bible even, shut down the dishes and go. to. bed. Otherwise, I’m asking for it the next day. And why set myself up for a struggle… doesn’t Satan do that enough as it is? Why should I make it harder on myself!?? !